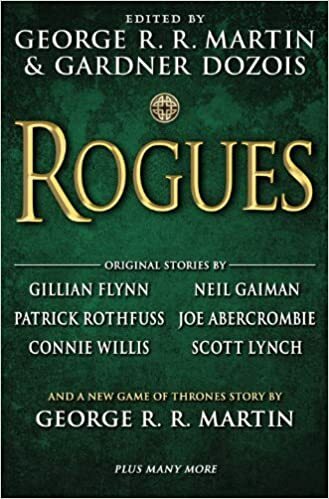 A thrilling collection of twenty-one original stories by an all-star list of contributors—including a new A Game of Thrones story by George R. R. Martin! If you’re a fan of fiction that is more than just black and white, this latest story collection from #1 New York Times bestselling author George R. R. Martin and award-winning editor Gardner Dozois is filled with subtle shades of gray. Twenty-one all-original stories, by an all-star list of contributors, will delight and astonish you in equal measure with their cunning twists and dazzling reversals. And George R. R. Martin himself offers a brand-new A Game of Thrones tale chronicling one of the biggest rogues in the entire history of Ice and Fire. Follow along with the likes of Gillian Flynn, Joe Abercrombie, Neil Gaiman, Patrick Rothfuss, Scott Lynch, Cherie Priest, Garth Nix, and Connie Willis, as well as other masters of literary sleight-of-hand, in this rogues gallery of stories that will plunder your heart—and yet leave you all the richer for it. And an Introduction by George R. R. Martin!